Is your plant looking for a flexible connection in a glass-lined piping system? Are you looking for a product that will lower maintenance cost and down time due to long term durability? PTFE Bellows from 4B Plastics is the answer! 4B Plastics can make PTFE Bellows that will resist highly corrosive chemicals and aggressive services! Bellows made out of PTFE have a high chemical resistance of up to 500 degrees Fahrenheit or 260 degrees Celsius! 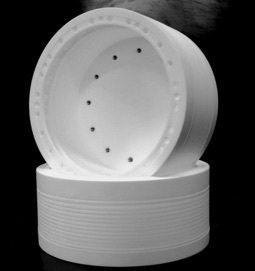 4B Plastics PTFE Bellows are designed for thermal strain and expansion and vibration! Also these Bellows help in the axial, angular, and radial motion. Contact us today to discover how we can create the exact product you need to improve the efficiency of your operations.